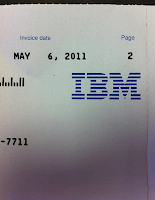 One of my clients asked me to review this invoice before paying, and my first thought was: "holy crap, IBM is still running perforated paper through dot-matrix printers to generate invoices!" 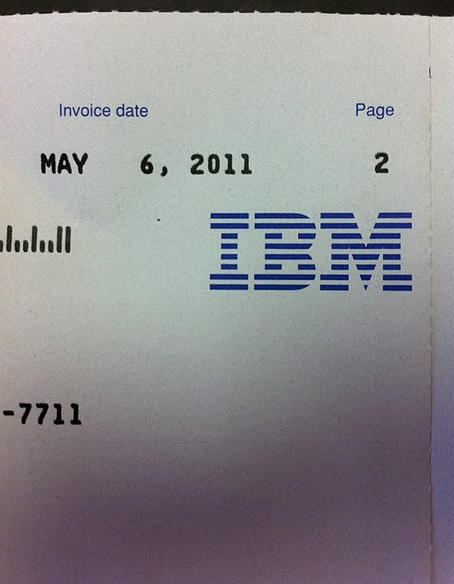 In this case, the bill is just for a couple software licenses, but can you imagine being a Fortune 100 company and signing a multi-million consulting deal with IBM, in which they've proposed to deliver the latest and greatest technology solutions as advertised on this past weekend's golf coverage, and getting the first bill from them like this? Granted, the Sr. VP who signed the agreement is never actually going to see the physical bill, but nevertheless...this does not inspire confidence.